A complex scene involving a variety of mushrooms with insects and various other plants. 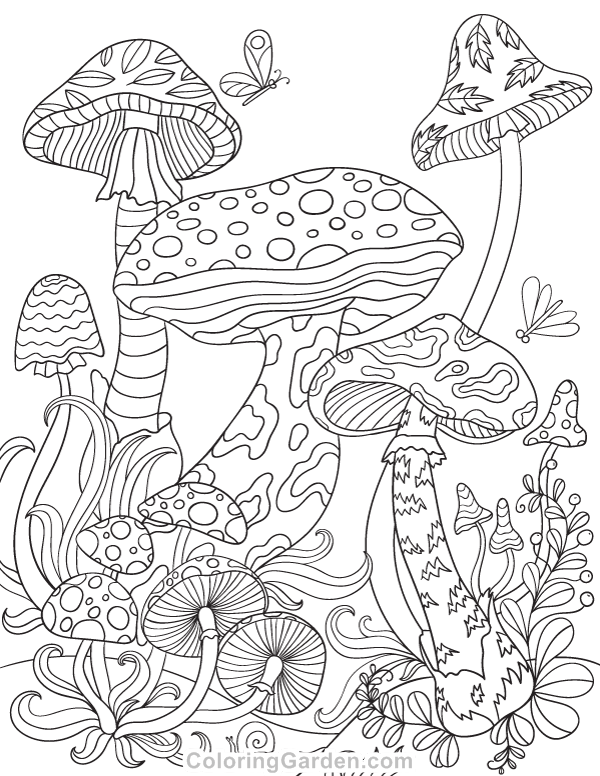 Get this coloring page without the watermark for only $0.99. The free version of the coloring page includes a watermark and copyright notice at the bottom of the page. Get the premium version to get the coloring page without this text. Download the PDF file for the coloring page. Open the file in Adobe Reader. Other PDF readers may work too, but you should try Adobe Reader if anything displays incorrectly. Print on 8.5 x 11 paper for best results. Make sure you select "Actual Size" in the printer options so the cards will print in the correct size. Note that the wording for this option may vary depending on the software you use. If you don't see it, look for an option to disable scaling or set the size of the print. In some cases, the coloring page may not print to the edge of the paper. Please note that this is a limitation of your printer and not something wrong with the PDF files. You need a printer that supports borderless printing to print to the edge of the paper. Use colored pencils, gel pens, crayons, or other art supplies to color the page. You may print our coloring pages for non-commercial use. You may not sell or distribute our coloring page files. You may not sell printouts of the coloring pages. You may not create derivative works based on our designs. If you want to share our coloring pages with someone, please share the link to the page where the files are hosted rather than sharing the files themselves.